The scoop on buying used baby gear. A friend offers you the car seat her son has outgrown. Should you accept it? Probably not, unless the seat is almost new and you are certain it has never been in an accident or subject to a recall. "With used products there's an increased chance that something's broken, worn out or doesn't work right," says Sandy Jones, co-author with her daughter, Marcie Jones, of Great Expectations: Your All-in-One Resource for Pregnancy & Childbirth and Great Expectations: Baby's First Year (both, Sterling). Ideally, any gear you rely on to protect your child—whether it's car seats, strollers, even cribs—should be purchased new. Safety standards change, plus straps, buckles and harnesses wear out. "With cribs, screw holes can weaken, and the glue and staples that hold the bars could be affected," Sandy Jones says. 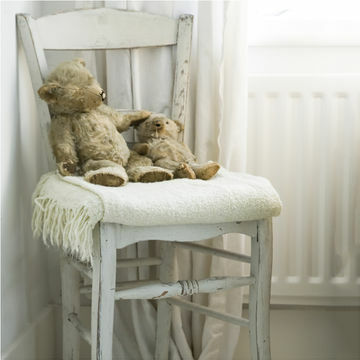 If you do buy a used crib, inspect it carefully to make sure all the parts are present and in working order, and use a soda can to test the spacing of the bars; if the can fits through, the bars are too far apart and pose a strangulation hazard. Avoid strollers sold at yard sales, as the tire treads tend to be worn out and the reclining mechanisms on their seats may not work well. If you accept a used stroller from a trustworthy friend or relative, first roll it around with a child in it. "Wheels get out of alignment, veer to one side or become wobbly," explains Jones. "You can't tell how it will steer until there's a weight inside." In general, don't accept used products that could have hygiene issues, such as a crib mattress or breast pump. Rental breast pumps are the exception; the bottles and tubing are designed so that the milk never touches the working parts of the pump. (For additional guidance on buying used baby products, go to fitpregnancy.com/buyingtips.) For baby-product safety information, check out the U.S. Consumer Product Safety Commission (cpsc.gov) and the American Academy of Pediatrics (aap.org). Also, the infant/child section of recalls.org provides extensive information on recalled products. pads.